The Hodogaya Chemical Group strives to create values for the various stakeholders including our shareholders, customers, partner companies, local communities, and employees; contribute to the development of domestic and global economies and industries for the prosperity of society; ensure the soundness and legality of management; and increase efficiency, all the while steadily supplying“ Only One/Number One” specialty products in the global and niche markets. We have established these targets as highest priority of management as we work toward enhancing and strengthening our corporate governance system. iming to ensure the effectiveness of our corporate governance and to improve our corporate value, Hodogaya Chemical made a transition to a“ Company with an Audit & Supervisory Committee” structure in June 2015, to further strengthen the Board of Directors’ supervisory functions with the participation of Outside Directors. To increase the speed and agility of corporate management, Directors are entrusted with the decision-making on all business operation matters other than matters that should be solely for the Board of Directors to determine as required by laws and regulations. Meanwhile, Directors report the performance of their duties to the Board of Directors, as well as mutually monitor and supervise the performance of duties with other Directors. The Audit & Supervisory Committee supports the supervisory functions of the Board of Directors, and evaluates the Board of Directors by assessing mainly such items as to whether the Board of Directors is conducting thorough discussions on the appropriate agenda items based on its role, and whether a sufficient support system is in place to enhance the content of discussions at the Board of Directors’ meeting. Additionally, in January 2018, the Company shifted into a new management structure which facilitates separation of the“ strategic decision-making and supervisory functions of management” from the “prompt executive functions of business strategy,” with a view to further strengthen its supervisory and executive functions. As a result, the number of Directors who are not Audit & Supervisory Committee Members has been reduced from seven to three. Accordingly, the ratio of Outside Directors is now 37.5%. In addition to the appropriate statutory disclosure and timely disclosure, Hodogaya Chemical strives to proactively provide shareholders and investors with relevant information such as its management strategies, in order to gain understanding on its business activities. It also establishes measures to encourage shareholders to attend the General Meeting of Shareholders. It engages in constructive bilateral dialogue with shareholders in an effort to achieve effective corporate governance that can contribute to sustainable growth of Hodogaya Chemical and increase its corporate value. 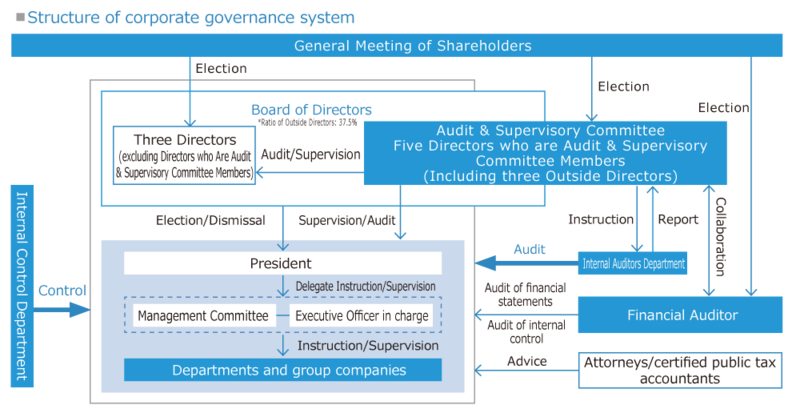 To enable thorough discussions based on diverse opinions and prompt, rational decision-making, the Board of Directors consists of a total of eight Directors, including“ Directors (excluding Directors who are Audit & Supervisory Committee Members)” and“ Directors who are Audit & Supervisory Committee Members.” Sets of criteria for the election of Directors are established. Among other things, an Internal Director should have the personality, extensive experience, and quality to appropriately serve as a corporate manager, and an Outside Director should have appropriate experience and knowledge cultivated by broad business experiences. At Hodogaya Chemical, those who are considered to possess these qualities are reviewed and nominated as candidates for Directors by the Board of Directors. Reasons for nomination as candidates for Directors, including career summary, are published in the Reference Documents for General Meeting of Shareholders which can be found on our corporate website. The Audit & Supervisory Committee consists of five Directors (including three Outside Directors), and audits the legality of business execution by Directors and officers, appropriateness of the Company’s business operations, internal control, and financial status, etc. by attending important meetings and ordering timely and appropriate reporting from Directors, Executive Officers and employees of the Hodogaya Chemical Group. The Audit & Supervisory Committee also maintains close relations with the Financial Auditor to take necessary measures in relation to the audit work. The executive officer system of Hodogaya Chemical was introduced in view to (1) streamline management, (2) as a result enable quicker decisionmaking, (3) specialize functions, (4) strengthen supervisory and monitoring functions, and (5) strengthen our business management. Executive Officers who can fulfill these goals have been elected by President to execute the business of our core departments. Hodogaya Chemical appoints Grant Thornton Taiyo LLC as its Financial Auditor, and in addition to financial audit services, receives advices on accurate and fair business practices through internal control audit. Hodogaya Chemical has the Internal Control Department that continuously reviews and evaluates that a group-wide internal control systems required under the Companies Act and the Financial Instruments and Exchange Act are in place and implemented, and ensures that any existing business risks are maintained lower than the predetermined level. We maintain and strengthen the level of our group-wide internal control, and promote various policies to ensure that our business operations are conducted in an appropriate and effective manner. Hodogaya Chemical has the Internal Auditors Department that monitors our internal control system in accordance with the Companies Act, etc., and ensures the appropriateness of our business operations.It also serves as the secretariat of the Audit & Supervisory Committee and supports the Committee’s operation and helps maintain and improve the audit quality. At Hodogaya Chemical, candidates for independent outside directors are selected from among those who meet the Tokyo Stock Exchange’s requirements of independence and possess extensive experience and knowledge. Accordingly, the Company has registered three of the Outside Directors as independent officers specified by the Tokyo Stock Exchange, and if the Substitute Director Who Is an Audit & Supervisory Committee Member is appointed as Director, the Company intends to register him as independent officer specified by the exchange. Note that one of the Outside Directors and the Substitute Director Who Is an Audit & Supervisory Committee Member had been employees of a financial institution which is a major lender to the Company; however, nine years have elapsed since they left said financial institution. Therefore, the Company deems that there are no concerns over their independence. Every task at the Legal Department begins by gathering information. We cannot draft an appropriate contract unless we understand the laws and regulations and rulings that serve as precedents to the objectives we want to achieve. Handling legal disputes is also part of our job, and my experience as an attorney has helped me gain some insight on how to resolve disputes. Highly accurate information is essential in delivering quality results, but since the rules such as laws, regulations and precedents are changing every day together with the change in society, I try to keep my knowledge updated at all times. Corporate governance cannot be enhanced and strengthened unless not only the Legal Department but also all employees implement it, recognizing its importance, so I am hoping to support this initiative through my daily work.